Whenever we travel, Mom likes to bring me to see mountains, oceans or rivers because we don't have these in Singapore. Plus, she says the air is fresh and crisp in these places. Sometimes she will try to explain to me how the mountains are formed etc, and she always says that I will learn more about them when I go to school. We took a taxi from BIFF (Busan International Film Festival) Square to Taejongdae Park so that we could get there faster. According to Mom, the Nampo area 남포동 is the nearest tourist area from which to get to Taejongdae. The journey took about 30 mins and the taxi fare was 9500 won. Otherwise, we can take Bus 8 / 30 from Nampo Station 남포역 (Exit 6) → Taejongdae Terminus → 5 mins walk to the entrance of Taejongdae Park. We left the Park by Bus 88 / 101 to Busan Station 부산역 and it took about 50 mins. The bus fare is Adult - 1200 won, Child (6-12 years old) - 350 won. Using the transportation card Hanaro / Mybi / T-card, the discounted bus fare is Adult - 1080 won, Child - 290 won. I LOVE trains and trams! And taking the Danubi Train is the best and fun way to explore the park. But first we had to take a 15-mins walk uphill (100m) from the entrance to get to the train station. It was rather tiring and I think the steep incline made it harder. Phew! We finally reached the ticket counter, and Mom bought me banana milk 바나나우유 as a reward for making the long walk up. I really love to drink this milk! We got off at the 3rd stop which is the Observation Deck, and these amazing views greeted us! Instead of taking the train to the next stop (which will be a 20-min wait), we took a 10-min stroll to the Lighthouse. From the deck, I held on tight to Mom's hand and we went down several flights of stairs to get closer to the lighthouse. Although there was a lot of walking, the weather was cool so it was a nice walk. Then we continued downwards towards Shinsun Rock. From above, it looked very dangerous, and the path to the rock seemed like it's at the edge of the cliff. I told Mom that it was too scary and asked if we could go back up. Then it's back to the train stop to wait for the train to take us back. The disembarkation point is near the entrance so we did not have to walk the long way out. Note that the family discount does not apply to foreigners. 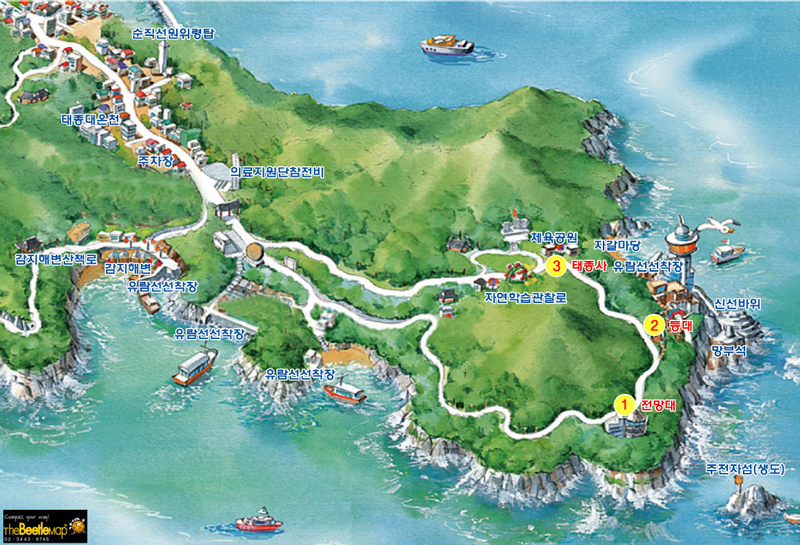 This a very helpful information for first time travellers in Busan. I'm glad I was able to find your article. Thanks a lot. think it will help me to get to this place..
Taejongdae Park is one of a must see when we are in Busan..
Good luck, and thanks for reading my blog! Good to check with the tourist office @ Busan Station in case new routes are added, or there are changes in schedules. MMarcus, you have done a good introduction. I will be going Busan swith my daughter. I will use your info as my guide. Keep up the good work. Thank you, and have fun in Busan! I noticed that your pics were dated September 2012. Me and my friend will be travelling to Korea first week of September, how was the weather like when you were there? Mom: The weather was mostly warm, and cool on some days. We went around in casual clothes, and we kept a light jacket or sweater on hand just in case. One can definitely work up a sweat with all that walking to be done! Sep - Oct are definitely the best times to visit Korea! Thank you, and we will keep on writing!